Who is a better coach: Šarūnas Jasikevičius or Dainius Adomaitis? There is no doubt that the team of SPA VILNIUS massage specialists is trained by the best in Lithuania – the internationally qualified ESPA trainers. ESPA is the gold standard of the SPA industry. It is not just a UK brand that makes high-quality cosmetic products that combine medical knowledge with nature’s gifts. It is a company that creates innovative SPA procedures for beauty and wellness. Only the best massage specialists from around the world can join the international ESPA trainers’ network. 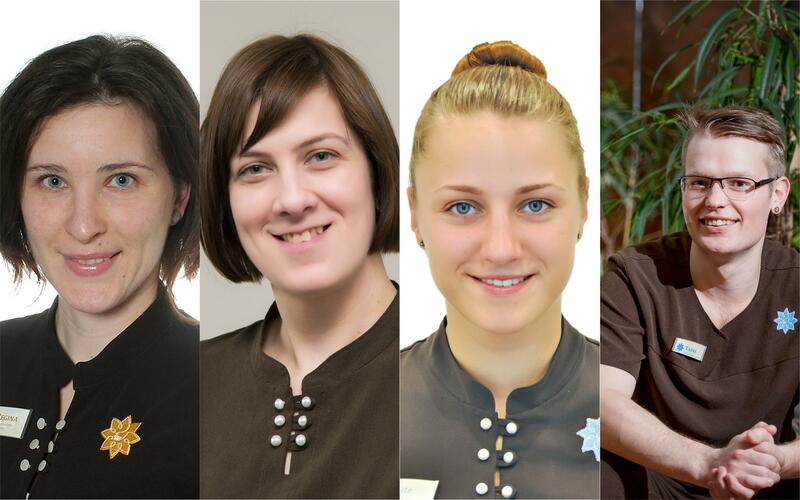 We are glad to announce that four of our massage specialists have just become ESPA trainers: Grėtė Mockūnienė and Tadas Stonkus from Druskininkai, Roberta Bareikaitė from Anykščiai and Regina Maceikianec who works at the Day SPA Centre in Vilnius. The main duty of ESPA trainers is to train SPA VILNIUS massage specialists to better apply ESPA massage techniques and select the right ESPA products that best suit each client. Also, the trainers take part in international ESPA training courses and share their experiences with their colleagues from all over the world. ESPA trainers encourage the whole team to improve. For example, our ESPA trainer Jurga Stravinskienė and her colleague masseuse Lina Derenčienė created a four-hands salt therapy that combines different massage techniques with the healing power of salt. We are also very glad that the new ESPA trainer Tadas Stonkus created his signature massage – a full body deep tissue and joint massage suitable for people who lead a sedentary lifestyle; it is a deep and rhythmic massage that regenerates tense and tired muscles and joints, perfect for recovery after physical training and relief of mental stress and tension. One becomes an ESPA trainer only by successfully completing the ESPA training course and passing special tests.